Today, four poems by Seamus Heaney, the Irish poet and winner of the Nobel Prize in Literature in 1995, just the year before Szymborska who I blogged about yesterday. So, we had two poets getting the Nobel Prize back to back! For many years now I have wanted to read his poems but have never gotten around to it. I did read many of the essays in his book The Redress of Poetry but am not familiar with his poetry at all (other than perusing through his recent book, Human Chain, couple years ago. So today provides an opportunity for me to at least read a handful of his poems. There is a famous long-ish poem by Heaney called Casualty that I was going to excerpt from but I think it should be read in its entirety at the link above or hear the poet read it here. So, I will instead end today's post with this lovely poem by him - the last line: "I rhyme / To see myself, to set the darkness echoing" sends shudders down my spine! I hope to get to reading more of him in the years ahead. 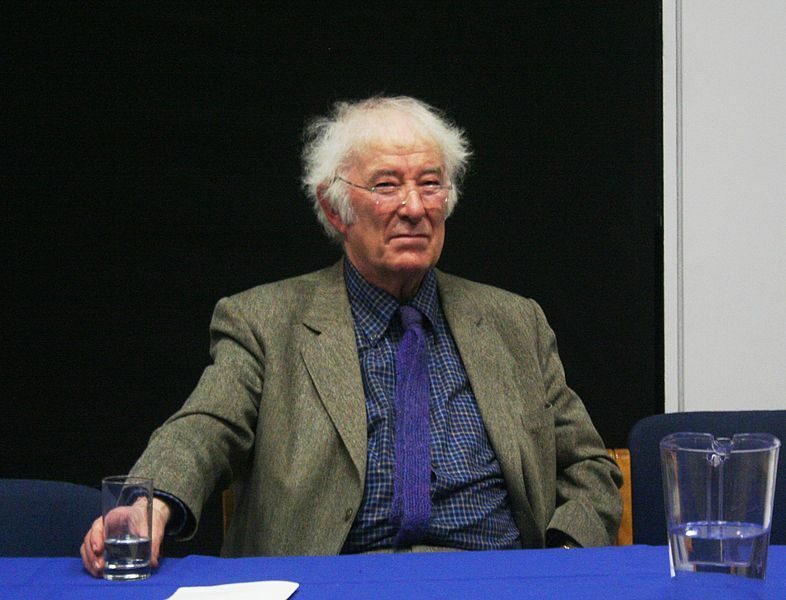 For now, I am going to listen to this interview on PBS Newshour with Heaney after his recent book, 'Human Chain'. His Nobel lecture is also worth reading in its entirety but I'll leave you with this excerpt from the lecture. There is another kind of adequacy which is specific to lyric poetry. This has to do with the "temple inside our hearing" which the passage of the poem calls into being. It is an adequacy deriving from what Mandelstam called "the steadfastness of speech articulation," from the resolution and independence which the entirely realized poem sponsors. It has as much to do with the energy released by linguistic fission and fusion, with the buoyancy generated by cadence and tone and rhyme and stanza, as it has to do with the poem's concerns or the poet's truthfulness. In fact, in lyric poetry, truthfulness becomes recognizable as a ring of truth within the medium itself. And it is the unappeasable pursuit of this note, a note tuned to its most extreme in Emily Dickinson and Paul Celan and orchestrated to its most opulent in John Keats, it is this which keeps the poet's ear straining to hear the totally persuasive voice behind all the other informing voices. Which is a way of saying that I have never quite climbed down from the arm of that sofa. I may have grown more attentive to the news and more alive to the world history and world-sorrow behind it. But the thing uttered by the speaker I strain towards is still not quite the story of what is going on; it is more reflexive than that, because as a poet I am in fact straining towards a strain, seeking repose in the stability conferred by a musically satisfying order of sounds. As if the ripple at its widest desired to be verified by a reformation of itself, to be drawn in and drawn out through its point of origin. I also strain towards this in the poetry I read. And I find it, for example, in the repetition of that refrain of Yeats's, "Come build in the empty house of the stare," with its tone of supplication, its pivots of strength in the words "build" and "house" and its acknowledgement of dissolution in the word "empty". I find it also in the triangle of forces held in equilibrium by the triple rhyme of "fantasies" and "enmities" and "honey-bees", and in the sheer in-placeness of the whole poem as a given form within the language. Poetic form is both the ship and the anchor. It is at once a buoyancy and a steadying, allowing for the simultaneous gratification of whatever is centrifugal and whatever is centripetal in mind and body. And it is by such means that Yeats's work does what the necessary poetry always does, which is to touch the base of our sympathetic nature while taking in at the same time the unsympathetic nature of the world to which that nature is constantly exposed. The form of the poem, in other words, is crucial to poetry's power to do the thing which always is and always will be to poetry's credit: the power to persuade that vulnerable part of our consciousness of its rightness in spite of the evidence of wrongness all around it, the power to remind us that we are hunters and gatherers of values, that our very solitudes and distresses are creditable, in so far as they, too, are an earnest of our veritable human being.